Yesterday at the huge Mobile World Congress (MWC) trade show in Barcelona, HTC announced three new phones. 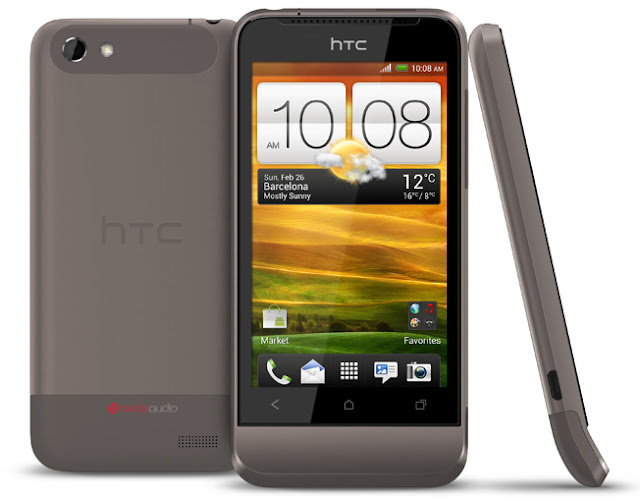 Two of them, the HTC One X and HTC One S are high end models with quad or dual core processors that will probably sell for over $500 unsubsidized and are unlikely to be picked up by any US prepaid carrier. The third phone, the HTC One V, is a solid midrange model with a 1 Ghz single core processor, 3.7 inch 480 x 800 px screen and a 5 MP camera. It also runs the latest 4.0, "Ice Cream Sandwich" version of Android. Initially only a GSM version of the One V was announced. But today at a press conference in New York City, HTC representatives revealed that there is also a CDMA version and that it's going to appear on Virgin Mobile, US Cellular and MetroPCS. The One V features Beats audio which is said to enable special features when used with Beats headphones. The headphones will probably be sold separately rather than coming with the phone. HTC is also touting the camera's speed, particularly its ability to focus and take a picture in .2 seconds and shoot 5 frames per second in continuous mode. Pricing hasn't been revealed, but I think a likely price would be a little over $200 on Virgin Mobile and a bit less on MetroPCS. HTC says that the phone will begin shipping in April. I suspect that the higher volume GSM version will appear first. I be surprised if the HTC One V appears on either MetroPCS or Virgin Mobile before mid May. The phone seems like a logical replacement for the Motorola Triumph on Virgin Mobile. It has specs that are similar to those of the Triumph (5 MP camera, 480x800 screen and 1 Ghz processor). Many Triumph users report performance and quality isues with that phone, including poor GPS preformance and light leaks at the bottom of the screen. HTC has a reputation for making quality devices so hopefully One V will be better. I'm not sure what place the One V fills in the MetroPCS lineup. The likely pricing of near $200 puts it into direct competition with Metro's current LTE phones. In addition MtroPCS has announced that it will deliver more affordable "LTE for all" phones later this year. It doesn't make sense for the non-LTE One V to be priced as high or higher than the LTE models. Unless Metro's variant is actually an LTE phone, which is possible, but seems unlikely. 0 comments to "HTC One V to Bring Ice Cream Sandwich to Virgin Mobile and MetroPCS"